Use our quick contact form to ask us a question. 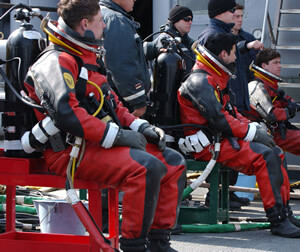 We repair, alter, and maintain drysuits & wetsuits worldwide. We've been repairing wet suits and dry suits for the past 20 years. We've done about every type of repair possible. Whether it's to small or to big there is many things that we can do to make things work better for you. We recommend that all dry suits be leak tested. Our method of testing enables us to see every inch of the suit. It starts with our commitment. Would you leave the repair of such an import item up to just anyone? That's why we are #1 in repair and maintenance of wet suits and dry suits.